STANLEY STORIES: Completely Off-Topic: A New CD Project! Completely Off-Topic: A New CD Project! This has absolutely nothing to do with John Stanley. Well, kinda-sorta... The '60s efforts of Sloan and Barri are another of my long-time popcult fascinations. This is the first-ever legitimate compilation of the duo's hits and rarities as songwriters. 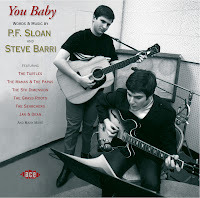 I would have liked there to be a larger percentage of rarities, as the hits are easily obtainable, all over the dang place, and some of Sloan-Barri's best material is also their most obscure. Say lah vee; I'm happy with the project overall. It's a handsome package, with superb sound quality. Like Germany's Bear Family Records, Ace takes the extra effort to do things right. The liner notes are something I'm proud of--they appear almost 100% as I wrote them. In my oft-Quixotic 30 year career as a freelance writer, it's exceedingly rare for my writing to not get mangled in some way in the final published version. Decidedly NOT the case here... let's hope this is a permanent change for yours truly! HERE is a link to Amazon's listing for the CD. It makes its official debut on June 8th. If you're among the 35% of Americans who can afford to still buy the occasional CD, consider this one. End of self-promotion. Thanks for your kind indulgence.